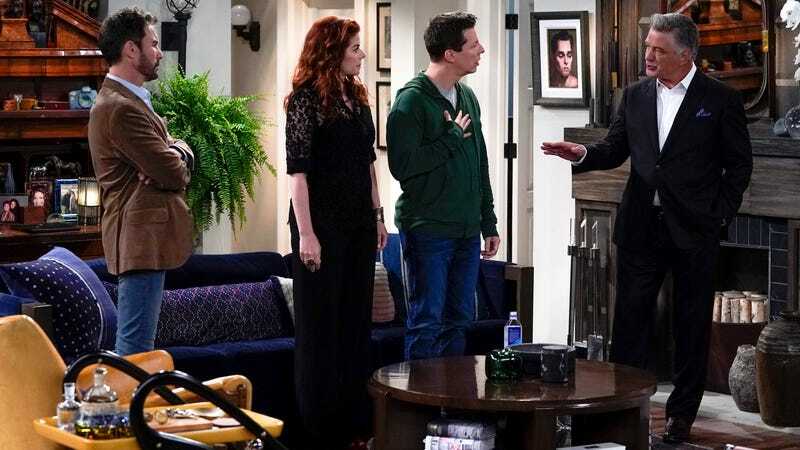 After a rocky start to the season last week, this Will & Grace episode is more like it: a carefully crafted and tied-up sitcom package. As the title indicates, “Where In The World Is Karen Walker?” is a tidy theme to wrap an episode around, as each of Karen’s friends flash back to their final interaction with her before her disappearance as a framework. Even the frequent references to Will’s dyed beard are pretty funny (I absolutely cracked up over “nobody thinks that Grace is a natural redhead!”), culminating in the episode’s final punchline as an effective throughline. But on a slightly deeper level, the episode opens with a wedding in the cold open (helpfully answering last season’s cliffhanger by explaining that Will and Grace’s parents do get married) and ends with a divorce, with frequent references to what commitment and monogamy mean for our characters, especially for Karen and Jack, throughout. "Where In The World Is Karen Walker?" It’s always a good idea to craft an episode around Megan Mullally’s Karen, which is another reason why last week was such a waste. Here she pulls out many valued tricks from her considerable arsenal: interactions with Smitty, who brings up the Hindenburg (“Oh, the hilarity!”), the Anastasia Beaverhausen alias, and her relationship with Stan, which, for all its twists and turns (and the fact that we’ve never seen him) has been one of the series’ longest lasting, outside of the main four. Karen’s new singlehood certainly opens up a lot of exciting possibilities for future episodes, the chance to see her date someone other than Alec Baldwin’s one-note Malcolm, and hopefully more scenes with Mullally front and center. But Karen’s not the only one at the end of a commitment: Jack’s relationship with Estefan remains difficult to pin down in more ways than one. Estefan is adorable, and as we saw last week, extremely supportive of Jack, so there’s no real reason for Jack to be as freaked out by Karen’s constant “Forever” refrain (almost sounding as ominous as “Nevermore”) except for the lifetime of monogamy that precedes him. As nice as it would be to see Jack finally settle down, it’s also fun to see him struggle, especially via the phone calls with his mother Judith, which I am considering a definite highlight of the current Will & Grace run (“Oh course it’s me, Judith!”). And the fact that Jack is hooking up with Estefan later indicates that maybe he’ll still get there eventually. Will also has a positive propulsion forward (also hinted at the end of last season), so jarred by his mother’s marriage that he makes a career switch into teaching law. It’s a much better path for the character than working with Grace, which made little sense and also for Eric McCormack, who’s usually stuck in the “straight man” role. Here he gets a chance to act out a bit in front of his new students and hide the whole beard dying thing, which seriously delighted me much more than it should have. So many things worked this time around, so of course there has to be a clunker; as previously mentioned, I hate the Grace campaign for presidency of the New York Society Of Interior Designers (“which is as important as it sounds”) so much. I have worked for tons of non-profits in my life—there is no way in hell that the presidency of a group of a few hundred professionals would garner actual news coverage, let alone a single poster. I have no idea where they’re going with this—I assume some political statement about Grace becoming drunk with power or something—but it’s a slog. And when everybody else is firing on such solid cylinders, the thorniness of this plot stands out all the more. Just Grace hanging out with the Westside Curmudgeon would be better. The crux of Will & Grace, after all, is that their significant others comes and go, their parents get married, but the four still have each other. The beard hug at the end of this episode exemplified that much more than last week’s plastic surgery errand, hopefully boding well for the rest of the season. Isn’t impersonating a police officer illegal? And wouldn’t the friends have noticed if Karen took a powder for five days? Would I hate Grace’s outfit as much as Karen would? : I can’t believe Karen didn’t say anything about it—the matronly black lace top with the “Grace” necklace that looked like something Carrie Bradshaw would have pulled out about 16 years ago. I did appreciate, though, that one of Jack’s tasks upon Karen’s desk is to burn Grace’s closet. How does Smitty always manage to keep it fresh and edgy? Karen seems so attached to Stanley this episode (despite her affair), that I wonder if her husband might actually make an appearance after all these years. Next week: In “Tex And The City,” it looks like the Italian Doctor DiLorenzo shows up, so that Karen’s plastic surgery plot resurfaces.